Books containing Thanksgiving poems for children are wonderful additions to a child's library. Poems about the festive holiday offer more than a primer for the celebration; they help children learn valuable lessons about thankfulness as they entertain. Parents have a few options when deciding which books with Thanksgiving poems for children to add to their library. Some selections feature a collection of poetry merged with children's Thanksgiving stories while others focus specifically on poetry. You can find thoughtful, playful, and funny poems for kids about this traditional holiday. Thanksgiving Day at Our House: Thanksgiving Poems for the Very Young by Nancy White Carlstrom is an inviting collection of poems for kids. The illustrations are expressive in the warm hues commonly associated with the fall season. The book contains 15 poems, beginning with "The Day Before" and ending with "Goodnight Prayer." In between are poems about the first Thanksgiving and story poems that prepare children for the occasion while building excitement. Thanksgiving Poems is a great selection that offers a collection of poetry from many different perspectives. Children develop appreciation while learning about immigration, American history and tradition. The collections include a psalm from the King James Bible, as well as funny poems and songs from Navajo and Osage nations. Over the River and Through the Wood: A Thanksgiving Poem is a beautifully illustrated children's book that celebrates the classic poem by Lydia Marie Child. Families have shared this popular poem for generations, many committing the verse to memory. Child's poem is easy to memorize when paired with the catchy melody many recognize from the song inspired by the lyrics. In Thanksgiving: Stories and Poems, Caroline Feller Bauer and Nadine Bernard Westcott partnered to create a lovely collection of poems, songs and stories about Thanksgiving. Celebrate the holiday with a rich ensemble of children's literature by famous writers paired with clean black-and-white illustrations. The book includes recipes that may inspire kids to get involved with preparing for the holiday. 'Twas the Night Before Thanksgiving by Dav Pilkey parodies the famous poem "'Twas the Night Before Christmas" by Clement Moore. The merry poem rings of Christmas, but the focus is on the Thanksgiving turkey's plight. The illustrations are equally playful with stunning illustrations in bold color. The parody serves as an offbeat primer for the Christmas holiday that soon follows. The Circle of Thanks: Native American Poems and Songs of Thanksgiving offers a different perspective. The collection contains traditional Native American prayers and songs as well as information about the culture of each group represented in the 13 short poems featured in the book. 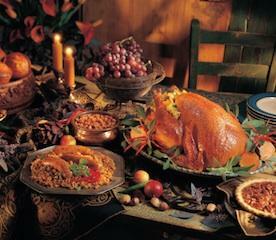 Thanksgiving poems for children embody the spirit of the holiday, whether using humorous, witty or thoughtful words. Poetry comes in many forms and you can find a variety of styles and perspectives about giving thanks during the holidays and throughout year. Thankfulness is a gift and parents can instill a deep appreciation for everyday things in their children. Simply sharing a few minutes every day to read to your child is a wonderful present that you can give all year long.